The Van Gogh Museum Edition collection is a series of high-quality reproductions developed by the Van Gogh Museum. The frame, the paper quality and the special giclée inks have all been selected with great attention to detail making them almost indistinguishable from the original. With a Museum Edition at home, you can enjoy the brightness and energy of Vincent van Gogh’s masterpiece for many years to come! Van Gogh made this drawing of The Yellow House (The Street) in October 1888 to give his brother Theo an impression of his home. Van Gogh hoped to found a painters' colony there where like-minded artists could live and work together.? This impressive facsimile is a high-quality replica developed by the Van Gogh Museum and is almost indistinguishable from the original. To ensure the highest quality possible, each facsimile is carefully examined and comes with a certificate of authenticity signed by our curator of drawings, Fleur Roos Rosa de Carvalho. 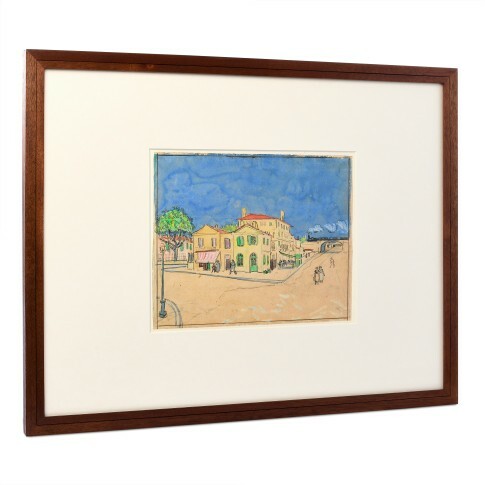 The wooden frame and the passe-partout have been created by the museum's frame maker and are identical to that of the original drawing on view at the Van Gogh Museum. The facsimile is framed behind 3 mm UV-resistant Optium Museum Acrylic with an anti-static and anti-reflective finish. The frame, the paper quality and the special giclée inks have all been selected with great attention to detail to create this exquisite Museum Edition. With a colour fastness of more than 140 years, you will surely enjoy the brightness and energy of Vincent van Goghs masterpiece for many years to come! Van Gogh Museum Edition, true to original size. Image: 25.7 cm x 32.0 cm, with frame: 54.2 x 69.2 x 2.4 cm. Framed with a passe-partout identical to the original. OLB-certified wooden frame, handmade by our museum's frame maker. Giclée print with a colour fastness of at least 140 years, guaranteed by the Wilhelm Imaging Research Institute.